We continue our series of web log posts about work completed at the end of last year. Although we've been really busy over the winter, we've almost caught up with all the news ready for the next stage of the build this season. Of course, one of the distinctive features of the KAIRA site is the beautiful wildlife. However, we do need to protect our sensitive experiment from the animals that roams these northern wilds. 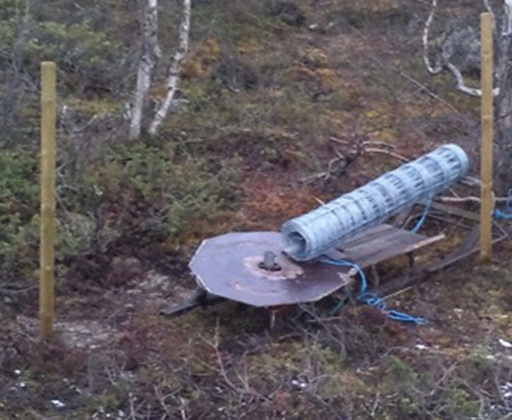 As mentioned last year, there was a reindeer fence that was installed around the full site perimeter. 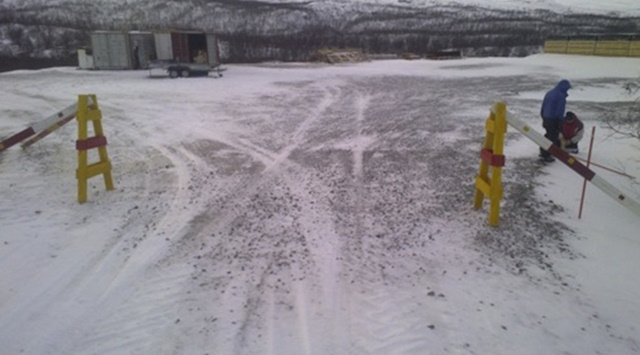 The following photograph (by Arttu Jutila) shows the site layout, with a faint yellow line marking the proposed route of the so-called reindeer fence. As we mentioned the posts for this were installed last summer and the wire spooled out from post to post to secure the area. Here is the wire deployment rig. Finally, some gate lines were added along the route to permit access. Here is the main entrance during construction last autumn. As you can see, the snow had started to set in back then. Of course throughout the winter it has been totally covered in snow. Note also the reflective markers. The fence itself is also marked to make it distinct in critical areas. As we also mentioned in a previous post, there are also snow poles around the area to mark difficult or dangerous terrain that may be hidden under the snow and ice.